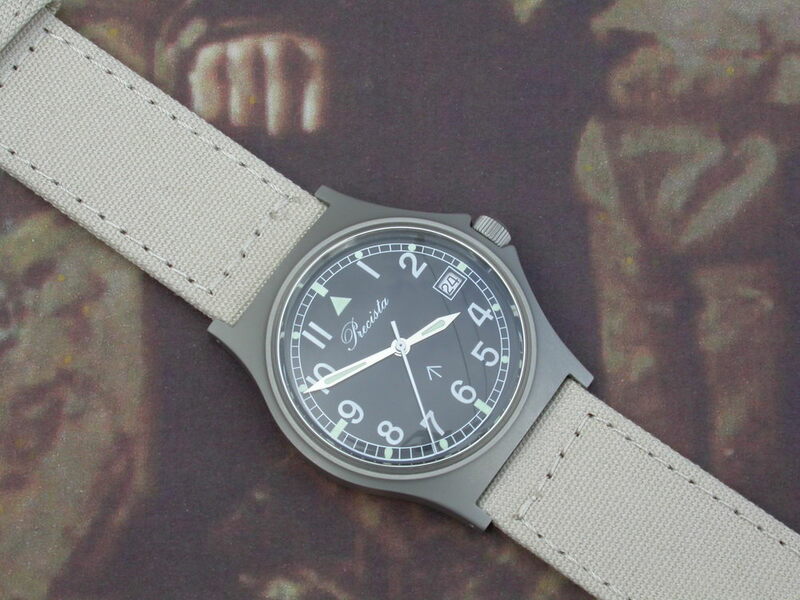 Up until the early 1980s the British forces (indeed, many other forces) were issued with manually wound watches which ranged from simple, low jewel count disposable watches (viz. some ‘Vietnam Era’ USA issued pieces) to high grade navigational timekeepers such as the IWC Mark XI. Between the two were a plethora of watches which were suited to and served many purposes. Of course, in those days it was necessary for the purchasing authorities to make use of what was within reason available to a certain degree ‘off the shelf’ – manufacturers would need to comply with various standards as laid down by the relevant department (for example fixed lug bars) but in terms of performance then requirements were kept within the bounds of reality given that for many decades the technology available was of course limited to purely mechanical devices as opposed to anything electronic. From a watch collector’s standpoint, the fact that many types of watch were issued to many branches opens up a wonderful collecting opportunity which has certainly become more popular since the early 1990s and indeed continues to be so; this is reflected in the upward trend in prices for most military timepieces. Depending on where one might focus then it could take years to complete a collection; take for example the type of watch which would have been issued to a serving member of the British armed forces (should he be lucky enough to be issued a watch – though that is another story); if we concentrate on the thirty years from late World War II through to the mid 1970s then we would find brands including Vertex, Cyma, Smiths, Hamilton, Jaeger Le Coultre, IWC, Omega, Timor, Record, Lemania, Eterna, Grana, and Buren. This list is of course not exhaustive and some brands mentioned would not have been issued as General Service watches, there were specialist requirements depending on the branch of service – for example divers’ watches and navigators watches. Interestingly, just five months after the issue of the DEF STAN from which this quote originates the first commercially available quartz watch was put on sale by Seiko of Japan with a claimed accuracy of five seconds per month. No doubt perfect for military applications but with a price tag of US$1250 per piece (the price of a Toyota Corolla) – not perfect for the budgetary constraints of a government department responsible for procuring thousands of wristwatches per year. Furthermore, a related word appeared (and was required) on the dial which had not been seen before on a British military watch – QUARTZ. The above illustration depicts with one word how things were changing; the case design shown above was that used in the mid 1970s by CWC and Hamilton for the manually wound General Service watch. As far as I am aware, there were no quartz variants produced using the above case. Whilst of course it is of great benefit for a soldier, sailor or pilot to have such accuracy available to him at all times one could argue that the romanticism and involvement that a mechanical watch entails is lost once a quartz movement becomes part of the equation. This might be true when seen from a collector’s standpoint but I doubt very much that such considerations were part of the MOD’s thinking when it came to watch procurement in the early 1980s! At the end of the day, a watch worn in combat needs to be accurate, reliable and rugged. By it’s very nature, an analogue quartz watch fulfils these requirements given that it has a minimum of moving parts and that it does not rely on springs for power generation and time regulation. So be it. 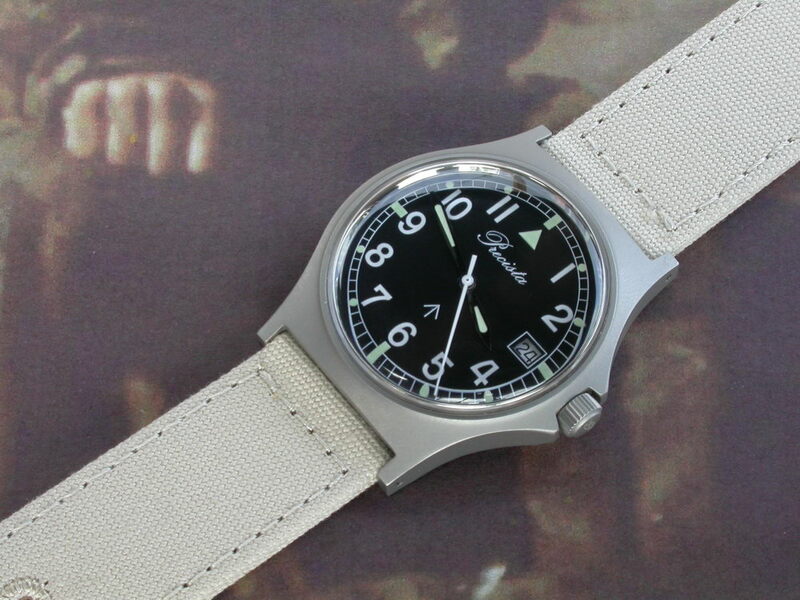 By the time of the Falklands conflict of 1982 the quartz General Service (and Navigator’s) watch was in regular issue in the same physical form that can be seen today. At that time there were two brands which were suppliers: CWC and Precista. 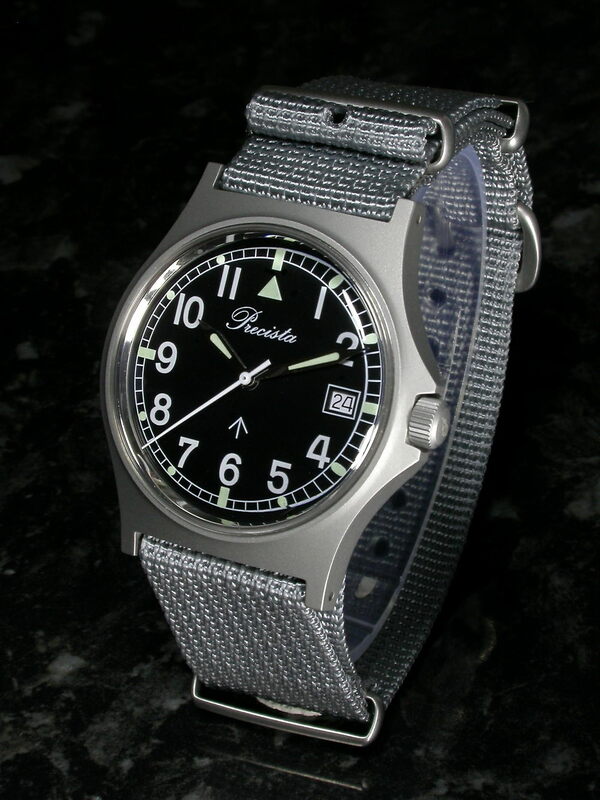 Today in 2008 CWC continue to supply two variants of General Service watch and Precista now offer a much improved version which exceeds military specification and is eminently suitable for wear by those who need a basic timekeeper that will keep on doing so for a decade with little intervention. I am a great believer in the plain and simple. With any analogue watch I prefer to see the time quickly and clearly and this is no doubt evident in other reviews I have authored. In addition, I do prefer to buy watches that have at least some authenticity with regard to any pedigree or claims being made. Real, not perceived quality is also important. 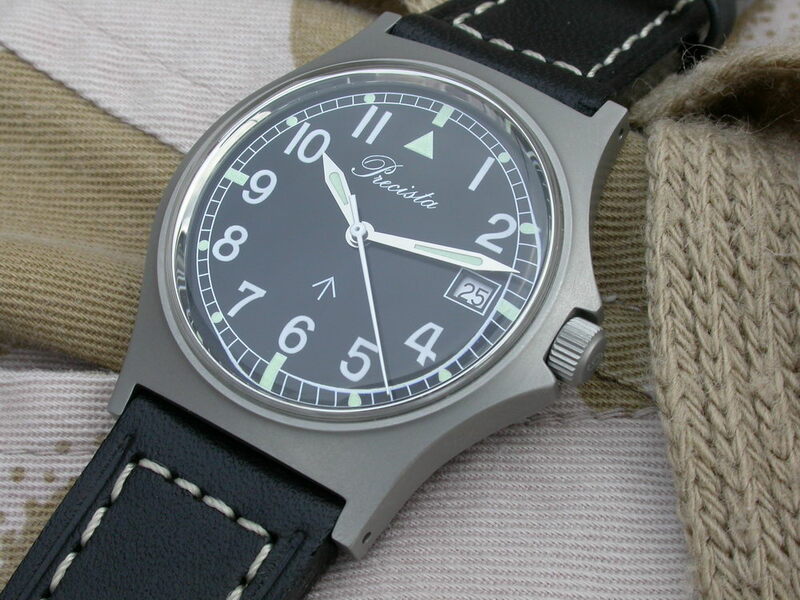 Introduced in June 2008, the new Precista PRS-10 could be considered the direct descendant of the General Service or ‘GS’ (also often referred to as ‘G10’) watch that the company supplied in the 1980s. 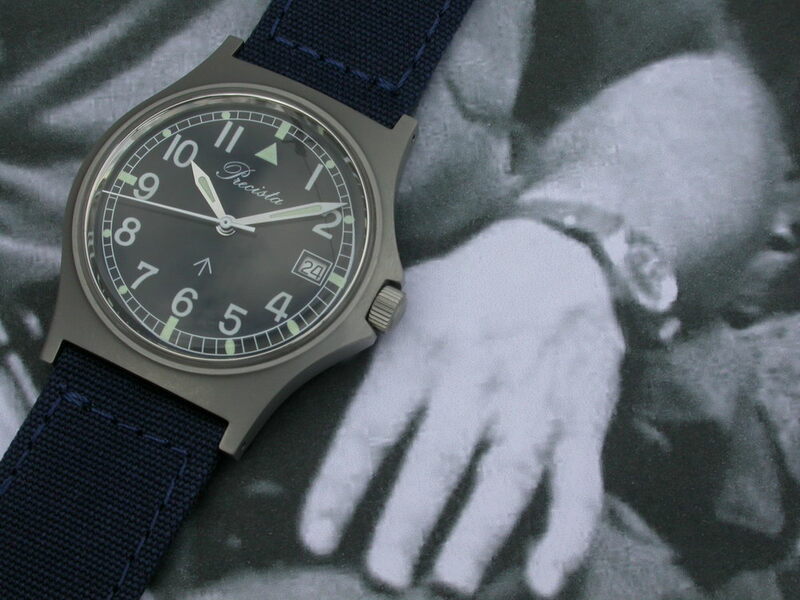 As an aside, many of the early examples of the Precista GS were supplied to the Royal Air Force as demonstrated by the ‘6BB’ prefix to the stock number engraved on the caseback. 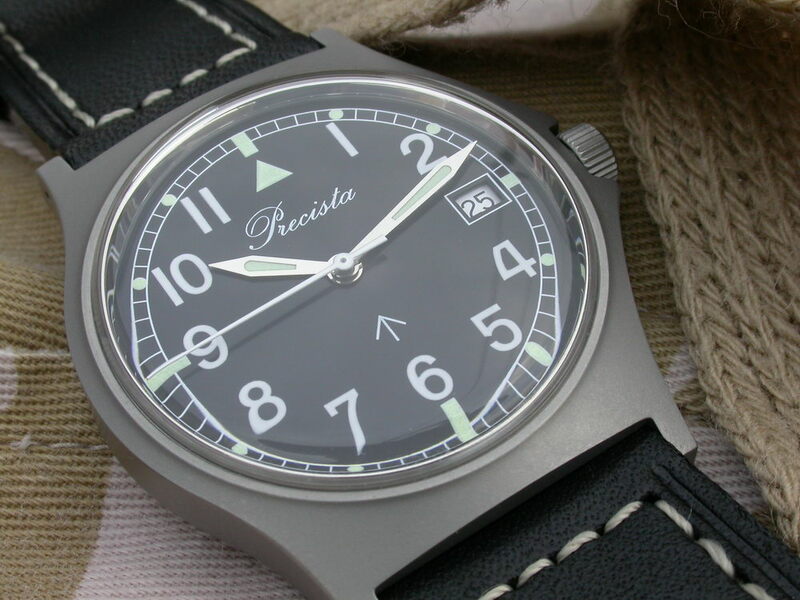 Thus, as is the case with the also recently introduced Precista PRS-5 (see separate review) this watch can be considered ‘authentic’ in terms of its pedigree if indeed that is important to a prospective purchaser. As I have mentioned in other reviews, military styled watches are aplenty in this day and age for more than one reason; image and ease of use are just two such. However, there are few watches which are styled as per current issue and indeed even fewer (the CWCs) which are actually issued. Spurious claims are made here and there by companies selling ‘contract overrun’ watches and the like. The actual contracts to which such watches pertain are in the main never revealed due to them being ‘Top Secret’ and so on and it is unfortunate that perhaps many purchasers actually believe some of the claims which are made on various websites and auction sites. Admittedly, some of these watches are reasonably priced at around £50.00 or so but they contain low or zero jewel budget movements coupled with mineral crystals which once scratched (which won’t take long) are marred for life unless replaced. At the time of writing there is also a penchant for ‘manufacturers’ to rebadge generic watches from China, add the now almost statutory marketing phrase: ‘ ..built to withstand the most extreme conditions…’ and militarise the whole package. Indeed, various online altercations have taken place between aficionados of military timepieces and some suppliers in terms of the justification for certain claims and indeed the quality of some of the offerings. It seems a fact that at this moment in time then the only GS watches that can stake claims to be issue are the CWCs GS and G2000; the latter being issued to the RAF in relatively limited numbers. If British military is what a purchaser wants in a time only, everyday, wear anywhere watch then a quartz powered example is what is current and what is indeed commercially available. This review is not intended as a comparison between one and another though given Precista’s policy of improving on an original then somesuch is inevitable. There is no doubting the practicality of the now twenty eight or so year old design of the quartz GS. This watch has been worn by British forces continuously for that period – from the Falklands campaign all the way through Gulf Wars one and two through to current operations in both Iraq and Afghanistan. Possibly for budgetary reasons, replacements have been tried with notable failures – Pulsar supplied a large quantity of GSs around 1999 for a period but they were equipped with weak crowns and poor quality mineral crystals. It was not so long before the MOD returned to sourcing the ‘classic’ GS. The concept, design, execution and performance could be relied upon within reason and now one of the original suppliers of this classic watch has brought to market what is in my opinion the most highly specified GS type to date – the Precista PRS-10. Is this a copy of something? No. Is it a homage to something? No. This is an improvement over all originals which doesn’t need to make claims or defend itself. 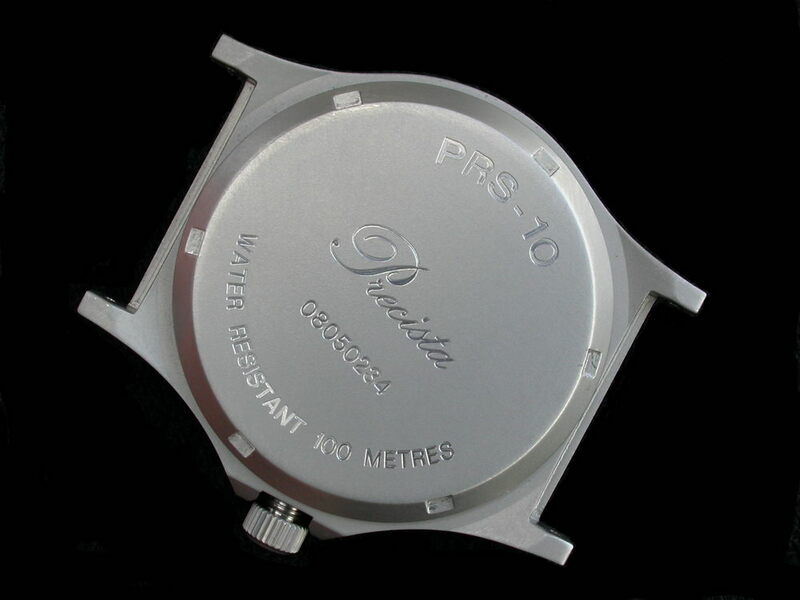 The no nonsense nature of the PRS-10 is reflected in the packaging which consists of the Precista ‘tube’ within which the watch sits strapped on a foam cushion. More foam protects the watch at either end which is excellent for short or long distance transit. As is always the case with any watch from Timefactors the outer packaging is more than adequate; very little chance of things going wrong on the way. Along with the watch is of course the Timefactors cloth, business and guarantee cards – duly filled in with serial numbers and date of purchase. And that is it. As now seems to be the norm with Precista, the watch doesn’t need anything to ‘sell it up’; there really is no reason to include anything that doesn’t have a purpose. Whilst this is not by any means a large watch, on first sight then it immediately had the desired effect – I was impressed with it and pleased that I had bought it. The aforementioned is something that I have repeated in various reviews about Precista but I feel it is important. First impressions matter, particularly when buying from an image on a website. 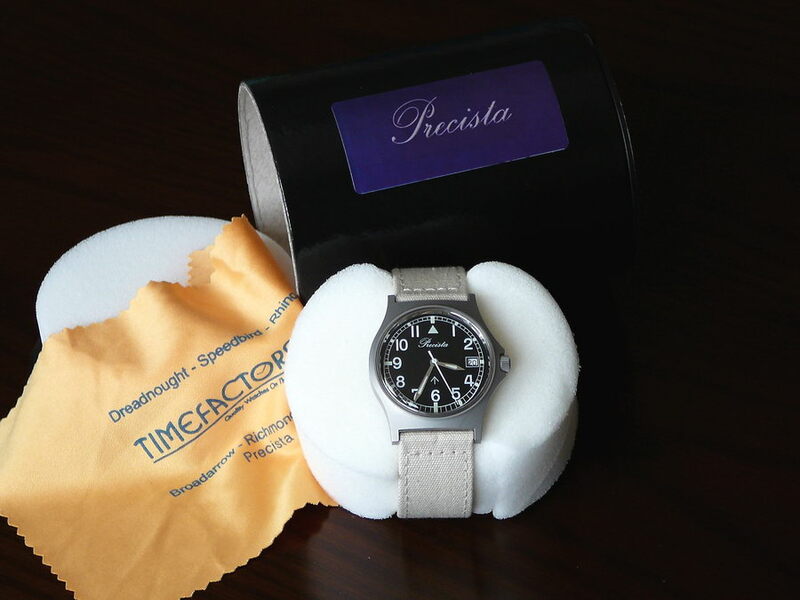 Precista watches have never failed to impress me on opening the tube, box, case and so on. The PRS-10 is no exception. It was also good to see the crystal protected by plastic and likewise the caseback. No doubt the watches arrive with such at Timefactors from the manufacturer but nevertheless it is a small but important attention to detail which is most welcome. The case style of the PRS-10 is of course of the ‘classic’ quartz GS design. Hailing back to the introduction of the quartz GSs of the early 1980s it is of a design which is in my opinion of much greater beauty (if that is the correct word) than its immediate predecessor which housed a manual wind movement and which can be seen in the DEF STAN drawing in the Introduction. This is by no means a large watch and it was never intended to be. It does not however look ‘small’ even on those with slightly larger wrists. The crystal area is large relative to the case itself which no doubt goes some way to accomplishing this. As I am sure has always been necessary with military timepieces, the watch is eminently wearable such are its dimensions. One dimension which has changed over all originals is that of the lug width: it is now 20mm as opposed to both the original specification of 18.5mm and the 19mm actual of the likes of current CWC. 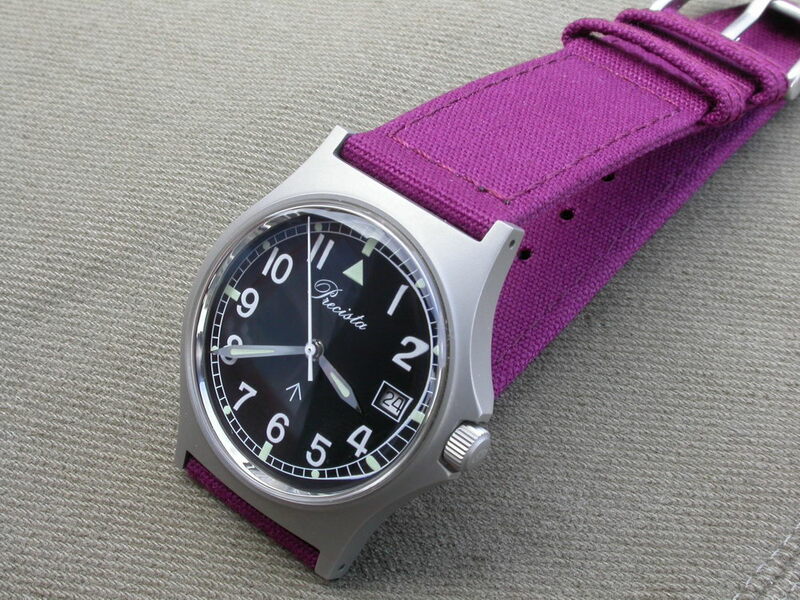 This is in my opinion an extremely welcome change; a 20mm NATO strap can now be worn without having to squeeze it on and there is now no need to wear an 18mm strap with gaps either side. Standard leather straps of 20mm can be fitted if so desired without issue. Aesthetically, the 1mm change in lug width has not made any difference and the lug area looks perfectly proportioned in relation to the rest of the watch. The case shape itself is what I would consider to be ‘modern’ – inasmuch as it combines curves in more than one plane with straight edges in others. It is quite obviously very much different to classically styled cases of earlier predecessors: Smiths W10 or Omega 6B for example. 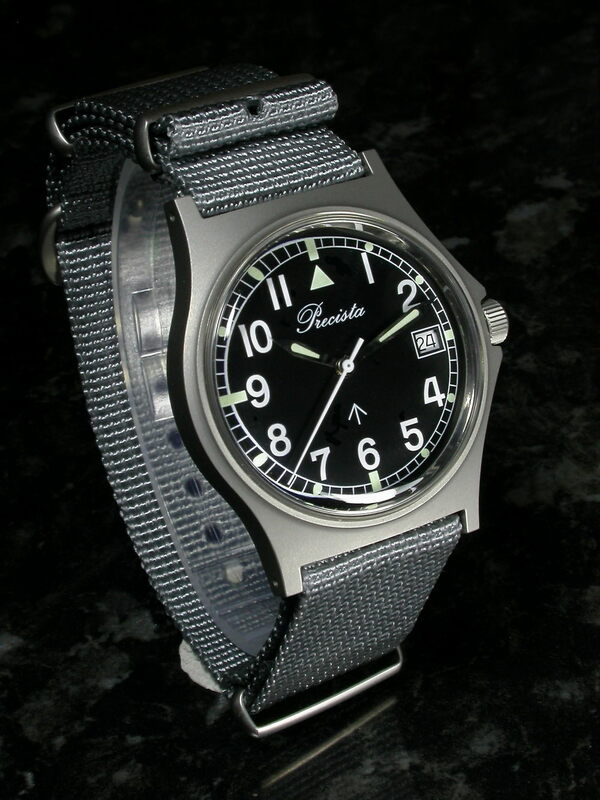 The Precista PRS-53 is also a good example of what went long before in terms of case design. There is no extraneous metal in the case design of the PRS-10; I have long admired it for being utilitarian yet very attractive at the same time. Its modernity (in my opinion) is suited to the use of a quartz movement and somehow I do not think that a mechanical movement would ‘work’! A larger crown for example (for ease of winding) just wouldn’t sit right within necessarily widened shoulders. The images below probably best illustrate the pleasing shape of the case from all angles. Such attention to detail is commendable and possibly in this day and age the exception rather than the rule. It seems that Precista are to a great degree doing things the old fashioned way and not cutting corners when introducing a new watch. As befits such fine casework, the sandblasted finish is just as well undertaken. 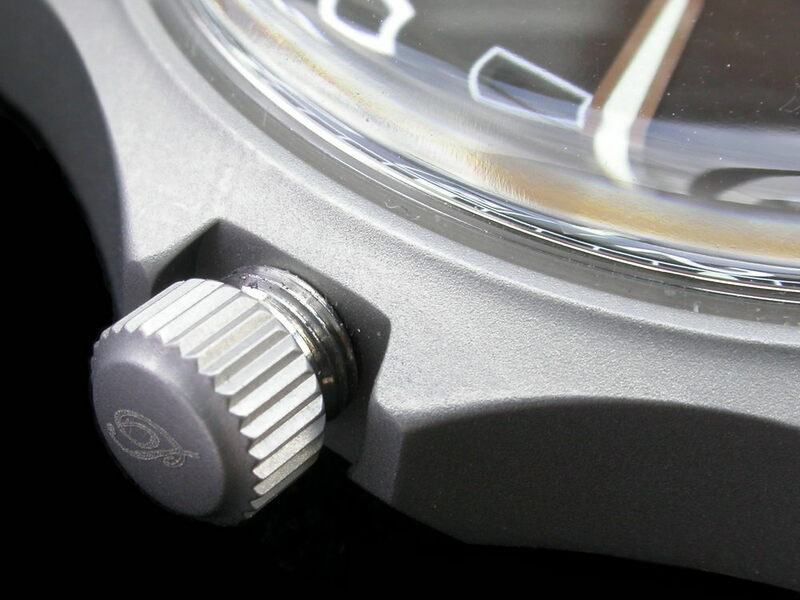 I would class this as a medium sandblasted finish for want of a more technical classification and it appears ‘industrial’ enough without resorting to the grainy and overblasted appearance that some watchcase modifiers seem to prefer applying to for example, dive watch cases. As a small diversion, it is interesting to note that the DEF STAN for electronic watches specified that the case must not be polished but ‘may have a satin or brushed finish’. As far as I am aware this was the first time that such reference was made to case finish for a GS watch and indeed, the satin (i.e. sandblasted) finish became very much standard for this type of timepiece. British DEF STANs pertaining to GS watches required lug bars to be fixed. In this case, Precista has chosen to equip the PRS-10 with drilled lugs (yet again, superbly executed) and removable bars. Personally I prefer fixed but given the improvements made to this watch over the original then it will possibly appeal to a much wider audience than previously for such watches; fitting of different straps and the ease of doing so must therefore be a factor in the decision to go with removable bars (and of course the 20mm lug width as previously mentioned). The crown of the PRS-10 is screw down. Never before as far as I am aware has a GS type been fitted with such and that fitted to this watch is a delight to use and in keeping with the rest of the case has been extremely well done. The size of the crown itself matches the case proportions perfectly and there is enough to get hold of in order to both unscrew and screw down easily; the crown release spring is strong and on unscrewing it, the crown pops out nicely for date or time adjustment. The crown tube is well threaded with three or so turns to fully screw down. Altogether, a well made crown which is topped off with the Precista ‘P’ being etched onto its end. Under a loupe it is quite obvious that this crown is well machined, cut and finished. It is a perfect match for the case. 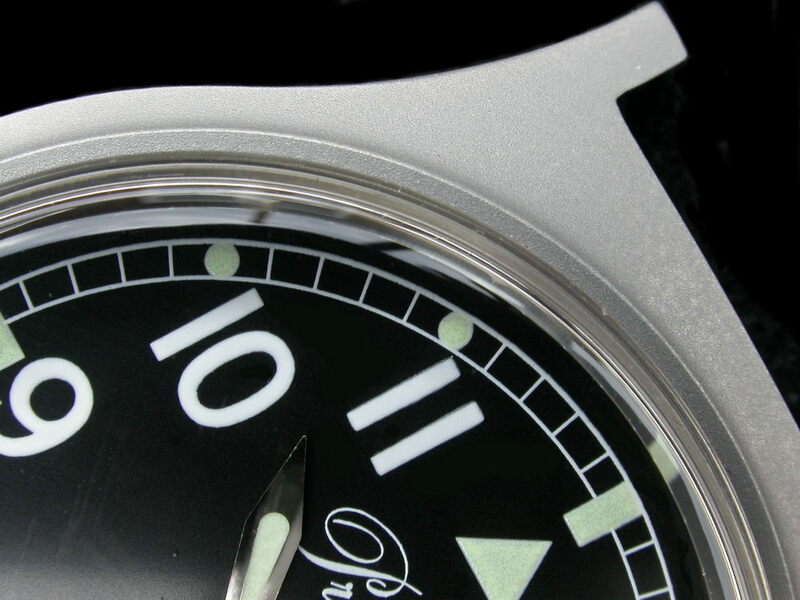 The caseback of the PRS-10 is traditional screw on. 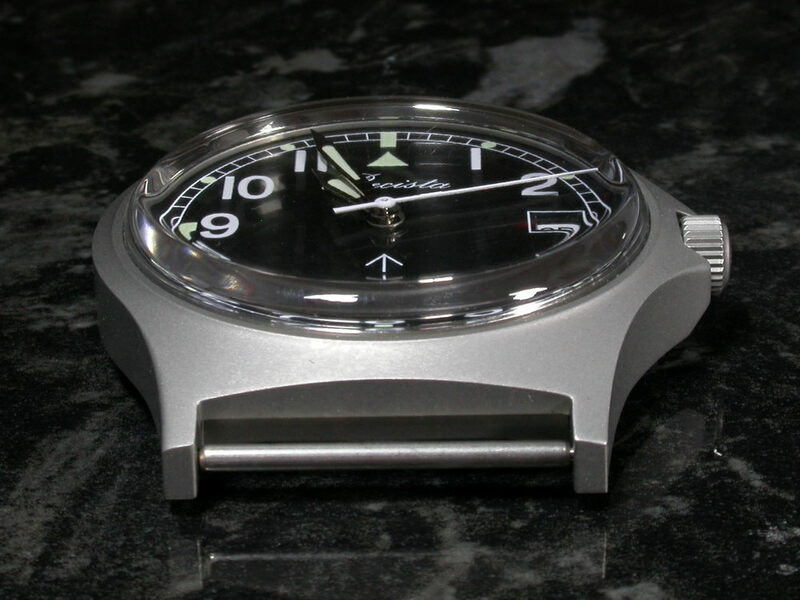 The original case as employed by Precista and CWC incorporated (as part of the DEF STAN) a press on caseback with an integrated screw down battery hatch. 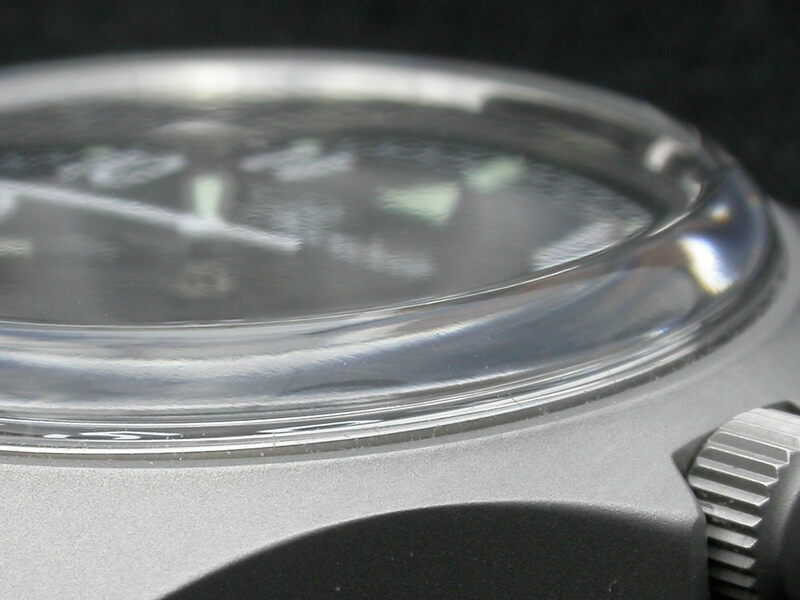 This arrangement was particularly prevalent on quartz watches of the late 1970s and early eighties possibly for two reasons: firstly, early quartz movements often had relatively short battery lives (though the DEF STAN actually specified a life of minimum of two years), thus a hatch was seen as a ‘user serviceable’ feature, secondly even if the caseback itself was easily removed by the user for battery replacement the manufacturers may have been concerned at the exposure to inquisitive eyes and fingers of the electronic components of the movement. Given the movement that the PRS-10 uses then the battery hatch idea is really redundant; thus the screw on back ensures that water resistancy is maintained without potential weak points of a press in back and a small battery hatch. A standard 6 slot arrangement is used for a removal tool (thus to change the battery) but given the movement used then this shouldn’t be necessary for a long time. The PRS-10 case is 100 meters water resistant. Whilst the British DEF STAN documents made certain requirements in terms of water resistancy, the go anywhere, do anything water resistancy afforded by a 100m rating has hitherto been unavailable in a watch of this type. CWC versions are now rated to 50m as designated by their caseback markings though I have heard of water ingression after fairly light use. The combination of the screw down crown, the screw down back and movement type mean that the PRS-10 would appear to the first truly low maintenance, high performance GS ever to appear. Finally to the crystal and this is one aspect of the GS design that thankfully Precista have chosen not to change. Thus, a standard polymethyl methacrylate (acrylic) is utilised; slightly domed and held secure by means of a polished tension ring. This crystal can be scratched but just as easily polished. In my opinion changing the crystal on the GS type is wholly unnecessary and could have spoiled the whole watch. Other sellers have advertised GS type watches humorously described as having “real glass” (mineral) crystals. Personally I see this as a reason not to buy a watch. 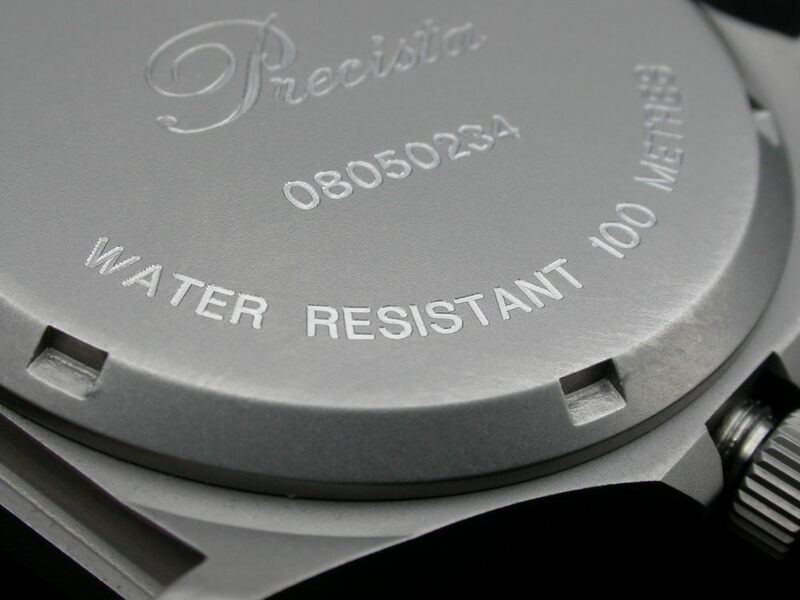 In conclusion, the Precista PRS-10 uses a designed and built from scratch case, extremely well cut, machined and finished with the benefits of a screw down crown, screw on back and 100m water resistancy to boot. Users can easily change straps and any crystal damage is easily polished out. The case specification and presentation defy completely the price bracket into which the watch falls and are more than a cut above other GS type watches (including issued) on the market and also of other military styles watches be they quartz or automatic from the likes of big manufacturers such as Seiko. British military watches have for a very long time utilised what I consider the easiest to read dials ever; of course, simplest is often best when is comes to functionality and seeing things at a glance. Should a watch wearer ever have had a watch with say a silver dial and silver hands then they may know what it is like to have to take second glances in order to determine the correct time. From a personal perspective this is something that I cannot live with and anything but the most legible and quickly read dials I find hard to tolerate. I have always found the GS dial design to be unbeatable in the legibility stakes. 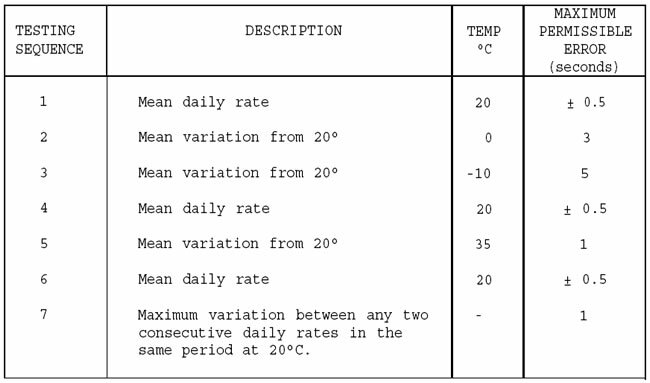 Thus, military specification in the United Kingdom has required Arabic numerals in white on a black dial. There have been minor variations dial design over the years but these would appear to have been manufacturer specific as opposed to requirement specific. Pre quartz General Service watches very much followed the illustrations of the relevant DEF STAN. 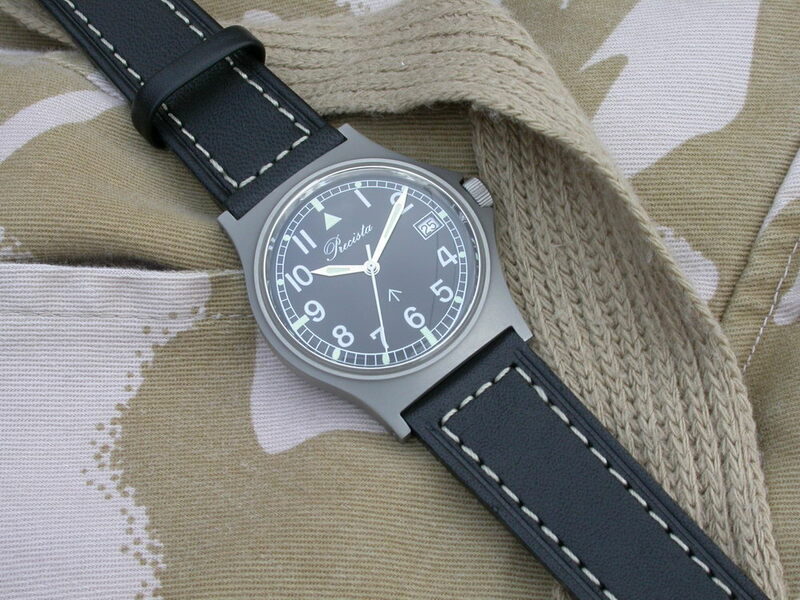 Thus, the classic British military dial design could be seen on many of the brands mentioned earlier in the review. However, by the mid – late 1970s the hand wound GS watch was in the main being supplied by CWC and Hamilton (in a very 1970s tonneau shaped case) with a dial that had changed in terms of the Arabic numerals; the numerals had become slightly larger and ‘fatter’ than had been the case before. 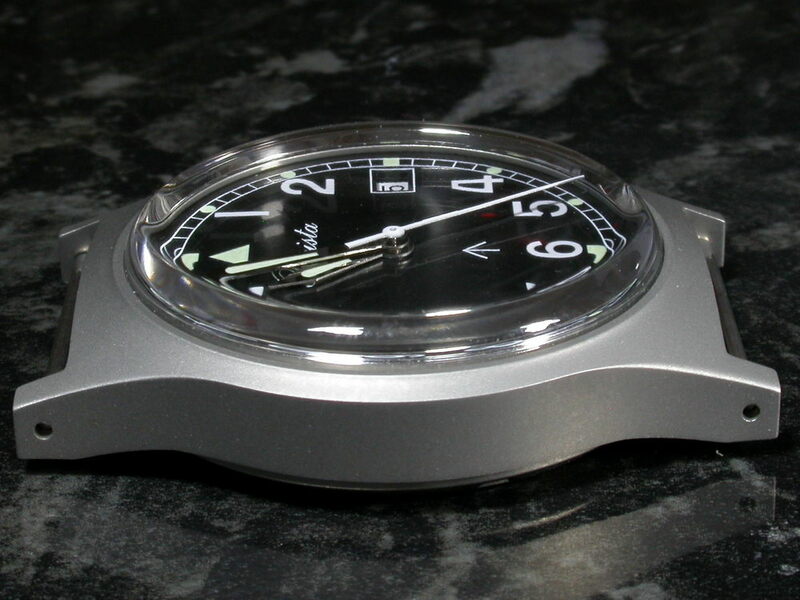 This latter dial design found its way into the recased quartz GS watch and has been the norm ever since (with the exception of course of the ill fated Pulsar which used its own dial design). In the instance of the new Precista, the dial font has been slightly refined; it is of course still Arabic but the numerals have been thinned down slightly with no reduction in size. There has also been no increase in size which is commendable given the current trend by manufacturers such as Citizen to oversize Arabic numerals to the extend that there is very little room left on the dial and with the result that reading the time becomes extremely difficult. What perhaps Precista has done in this case therefore is to take the opportunity to modernise and individualise as opposed to produce something that on first sight looks no different whatsoever to the likes of current CWC and some pseudo GSs. Thus, we have the classic black dial with outer ‘railtrack’, luminous rectangles at the quadrants (also a luminous triangle at the twelve) with luminous dots to the other hours; the aforementioned Arabics and a date window at three complete the picture. The dial is finished in what is almost true matt black but with an extremely slight satin finish which serves to ensure that dial does indeed look black and not the deep charcoal grey often resulting from ‘matt’ black dials. The finish is smooth, even and well applied; this is evident under a loupe as is the excellent application of the matt white Arabic numerals and outer track. The Precista logo is very discreet on this watch and it is pleasing to see it adorning a GS watch again after nearly quarter of a decade. Indeed, the logo on the PRS-10 is in fact more delicately applied than on the original where the font was slightly ‘fat’. 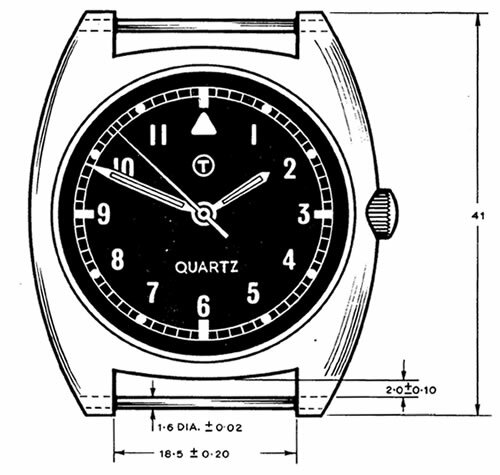 The DEF STAN for quartz GS watches specified the use of the word ‘QUARTZ’ on the dial above the six. This was of course some twenty eight years ago and in the civilian world, the use of this word on a watch dial has fallen out of favour somewhat and is possibly not necessary given the prevalence of quartz watches on the market. 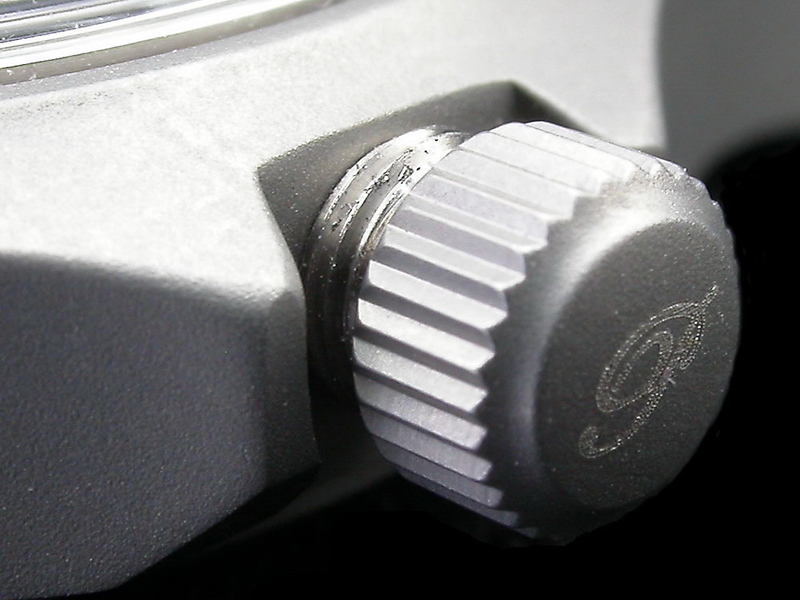 Precista have chosen not to include the word on this dial but have instead chosen to replace it with what was required immediately prior to GS quartz introduction – the Broadarrow. From a personal point of view, the QUARTZ moniker as required was perhaps the only aspect of the GS dial that I have never been fully comfortable with (but have chosen to ignore, I have worn many CWC). The replacement with the Broadarrow was for me very welcome and fitting, it has just as much right to be there as the word QUARTZ and indeed is traditional on earlier watches. Current issue CWCs indeed have the Broadarrow engraved on the caseback. Finally, this emblem of British government property serves to balance the dial perfectly on this watch, is not oversized and finely applied. Another change from what went before are the hands that have been chosen for the PRS-10. In this case, the white metal affairs that have been used for so long have been replaced with polished sword hands with rounded end luminous sections. Purists might question the change. 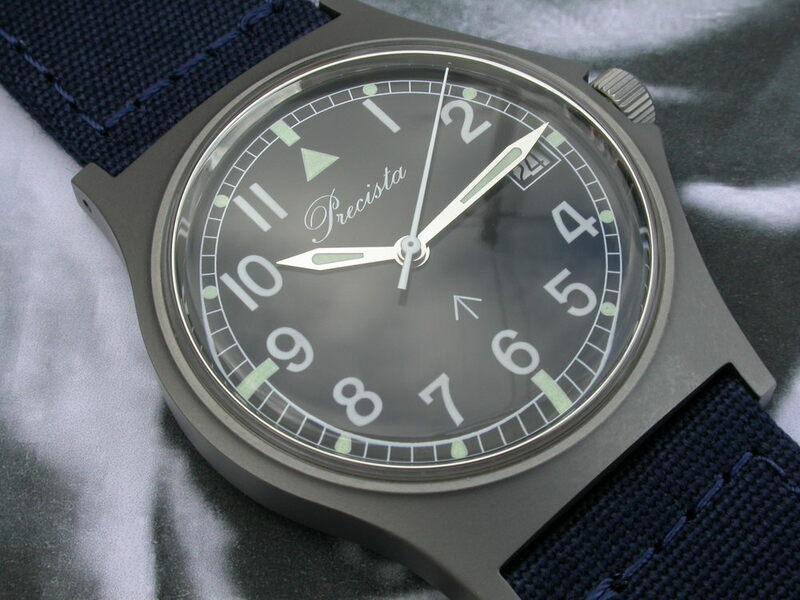 However I would argue in favour of Precista in this case as there is no real reason why not – after all, this watch is now so far ahead of standard specification that it would seem reasonable for Precista to add more than one element of individuality to it. The hands themselves are highly and evenly polished and have a good surface area given their wide sword shape. In very much the same manner as the hands of the PRS-53, the polished finish allows reflection of even small amounts of available light thus allowing the time to be seen in many light conditions. The luminous sections of the hands do not run full length as can be seen though their area is enough to ensure that the correct time can be read in all light conditions. The minutes hand runs well into the minute track thus allowing for perfect reading of half minutes and so on should that be necessary for any reason. Finally, the seconds hand: this is finished in gloss white, evenly and thickly applied paint on a delicately proportioned hand which extends fully into the outer track. 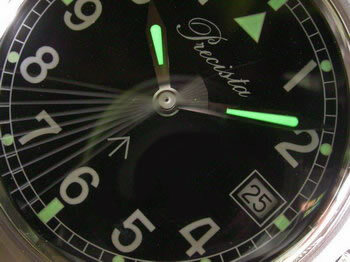 The luminous sections of the dial and hands use Super Luminova C3, light green in daylight with a green glow during darkness. The hands do glow more brightly than the dial initially and retain their glow throughout the night to a greater degree than the dial. For my purposes luminosity is more than adequate and during one week’s wear of the watch at no point was I unable to ascertain the time during the early hours of the morning. What didn’t occur to me until a while after receiving the watch was how the polished finish of the hands are complemented perfectly by the polished crystal tension ring (and vice versa). This adds a further element of balance to the dial/hands combination which is very attractive and serves to finish off the whole thing very well indeed. Overall, the fresh approach to the GS dial has been accomplished well; Precista have chosen to change things slightly in order to move away from the offerings of other suppliers and in doing so I feel that they have added another extremely worthy member to the growing range. At this point therefore it would be pertinent to say that as far as the case, crystal, dial and hands go, the PRS-10 is more than a cut above the competition. Whilst the outside of a watch is very important, just so is the inside. Whilst quartz movements are now produced in the many millions per year, there are of course good, bad and indifferent offerings from factories all over the world. One crucial aspect of the PRS-10 if it is to fulfil the objectives of improvement is of course what literally makes it tick. The move to quartz by the UK MOD was perhaps inevitable and logical given the practical advantages of such movements over those mechanical. Far greater accuracy and (usually) reliability, ruggedness and little user intervention are perfect when it comes to timepieces that are worn in the type of environments encountered by serving members of the armed forces. There may be one or two exceptions to this ‘rule’ but in the large majority of scenarios, a quartz watch would and does make far greater sense. It is of course the watch purists and enthusiasts that often decry the quartz movement as having ‘no soul’ and being inconvenient in terms of battery changes every couple of years or so. Interestingly, it is these very people that I have often observed selling their (mechanical or automatic) watches well within any period during which a quartz equipped watch would have needed a battery change! There is no getting away from the advantages of quartz. However, there are quartz movements and quartz movements. As previously touched upon, they range from mainly plastic construction zero jewel affairs to multi jewel chronograph types with complications which would cost many thousands of any currency one could care to mention should they be mechanical. A simple time only quartz movement itself can be found in many grades; again, from the cheap ‘throwaway’ types to highly decorated thermo compensated types capable of accuracy in the order of a handful of seconds per year. Somewhere in the middle are good quality gilt constructed calibres with logical and useful jewel counts and more than enough accuracy for all but the most critical applications. The main Swiss quartz movement manufacturers are ETA, ISA (though ISA is owned by a Hong Kong company) and Ronda. 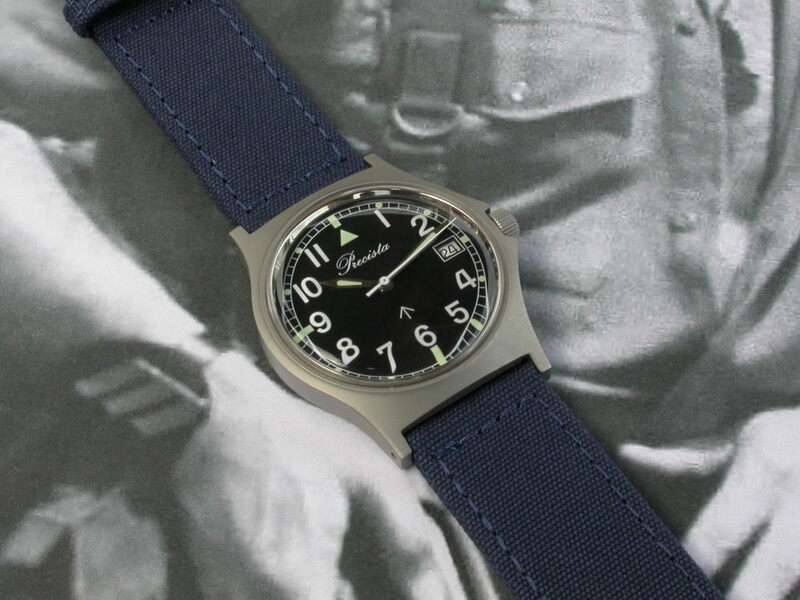 Pseudo military watches from the Far East are often found with low end ETA movements which are not repairable as such and essentially of the plastic throwaway variety mentioned above. 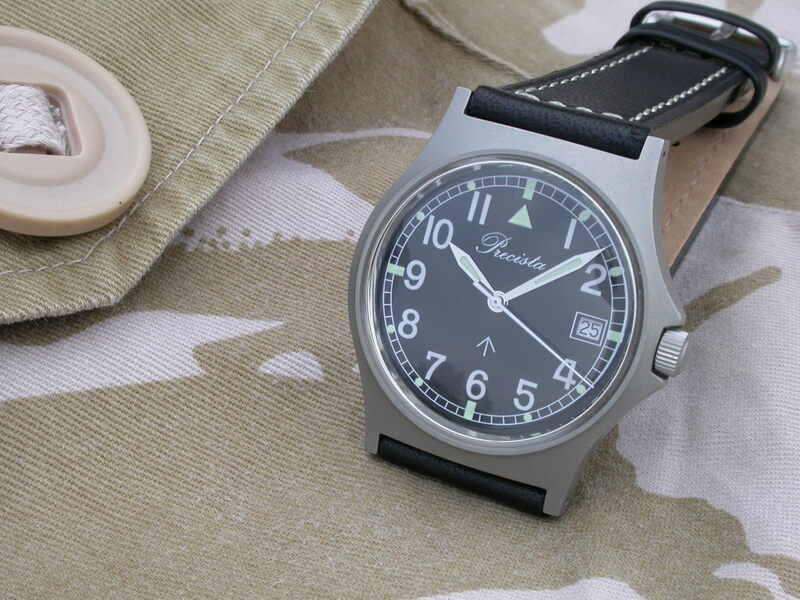 Issued military watches from the USA have often been found equipped with a budget ISA one jewel movement of reasonable quality (indeed, one of the original issued Precista dive watches used the same). Both the aforementioned will afford the user with around two year’s use before a battery change is required. 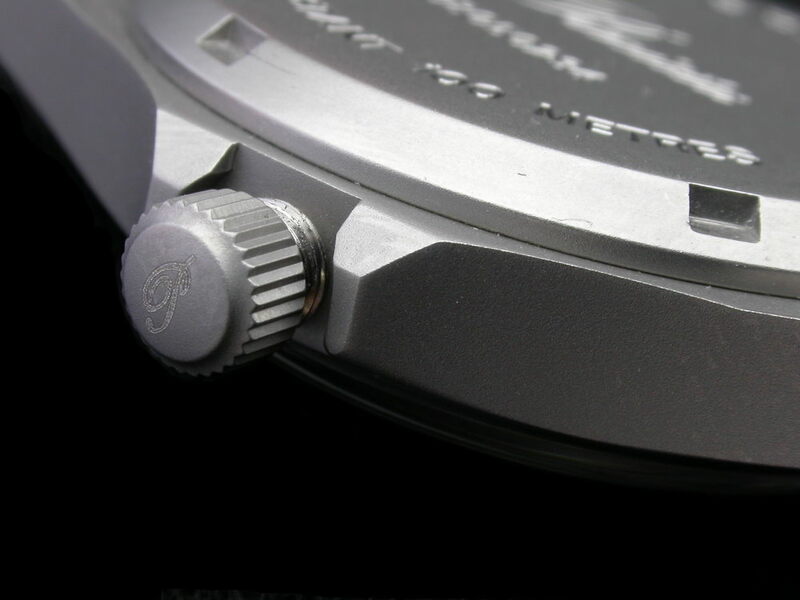 Interestingly, the ISA movement often used comes in a ‘hi torque’ version (which I think is little, if any more expensive than the standard version) designed for watches equipped with larger or heavier hands – I have often found it amusing that this version is often referred to in the advertising spiel of one or two watch suppliers; the ‘hi torque’ feature being seen as worthy of a marketing punt and it seems another example of justification of relatively high prices and selling the ‘butch’ factor to the buying audience. Issue British military quartz GS watches have always been equipped with good quality, fully jewelled ETA (formerly ESA) movements, capable of being repaired and capable of providing long-term service (as are many quartz movements to be fair). For me, this fact was always very welcome – I always took ‘comfort’ in the fact that a simple CWC GS watch had a good quality movement within and found dismay when opening a USA Marathon for example to find something more spartan and seemingly of lesser quality. Of course, any supplier to an armed force has a budget to work to; I do understand therefore the use of lesser quality components in order to reduce costs – watch manufacturers want to win contracts after all. However, what dismays me slightly is the sometimes ‘optimistic’ pricing of such watches when put onto the civilian market (particularly when the movement within costs in the order of US $7.00). In the case of the PRS-10, the policy of improvement is implemented by the use of a high quality Ronda movement with a battery life of ten years. Original specification called for at least two years, the ETA 955 series currently used by CWC will give around four years. The PRS-10 can therefore be purchased in the knowledge that given other improvements over the original specification/design, it can be used for a decade with little worry whatsoever. 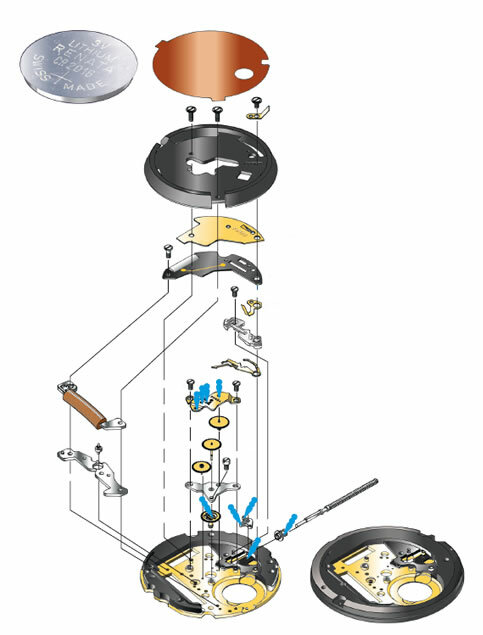 This version of the Ronda movement incorporates a date mechanism. 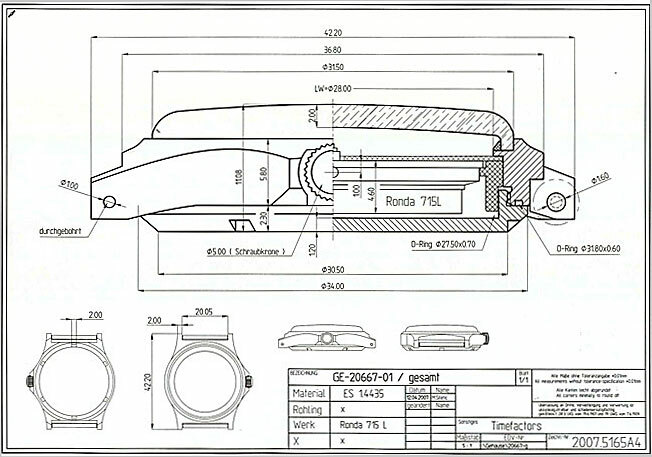 Eminently useful for most people, this feature was not part of the original GS specification but was however shown in the DEF STAN (66-4 Part 5/Issue 3) for the Navigator’s quartz watch and indeed specified for such timepieces. Furthermore, the dated Navigator’s version was stated as ‘May be used in all departments of the Ministry of Defence.’ I have seen some older issued CWC (Royal Navy) with date though these are now increasingly rare. The currently produced CWC (6B – Royal Air Force) is also date equipped but with a five year battery life. The PRS-10 has initially been offered with a black on white day wheel. I am aware that a white on black version is being offered also and the two types will run side by side. Interms of dial ‘balance’ then I feel that either date wheel is suitable given that there is a luminous dot at the three position. It would be purely down to personal preference as to which is chosen by a purchaser. I opted for the black on white wheel simply as it was the first available! In terms of performance, my example of the PRS-10 has gained less than one second in a little over a week. Such a fraction of a second in fact that it is hard to accurately measure. Performance should never be an issue in this regard which is welcome given that this timepiece is of the ‘pick up, wear and forget’ variety. The overall feeling I get is that the Ronda within the watch is of good quality, with good finish and of good performance. It is true that quartz movements are mass produced at relatively low prices (indeed so are many mechanical movements nowadays) – therefore it is pleasing to see that Precista have opted to use what seems to be the optimum choice for this watch. Given the specification of the watch, I was expecting the retail price to be nearer £125.00 than the level at which it sits. The screw down crown, screw on back, 100m water resistance and of course ten year battery life movement would all suggest a watch that would normally cost at least £100.00 and more. The closest competitor to the PRS-10 would be the CWC GS 2000 as it is closest in specification; however the CWC lacks the screw down crown, has a press fit caseback (with no battery hatch), is rated at 50m water resistant and has a battery life of five years as opposed to ten. The CWC however costs £10.00 more than the Precista at £99.99 before delivery. Given the purpose for which it is intended (e.g. as an everyday watch to be worn at any time) then I feel that the price is more than fair, is good value for money and I suspect that Precista’s profit margin has been sacrificed somewhat to ensure that the trademark value for money as is expected from this stable can be maintained. The current GBP/Euro exchange rate also make the retail price of this quite surprising. Quite simply in price terms as well as specification and performance terms the Precista beats the competition hands down. I have made no reference or comparison to other military (styled) watches as there is no comparison; specification, construction and marketing methods are poles apart. Yes, you can buy a lookalike for around £50.00 but ‘lookalike’ is all such a watch has in common with the Precista. For my money, such offerings don’t enter the equation. I have yet to purchase a Precista watch which disappoints. Indeed this can be said for any watch produced by Timefactors. The PRS-10 was announced some time ago and the wait has been well worth it. The company make no spurious claims about the watch, just quietly supply them through the website and make reference only to the improvements which have been made over the original. This is to be commended in this day and age of laughable ‘contracts’ and plagiarised advertising copy. The PRS-10 is discreet, legible, well specified, well engineered, wearable anywhere, accurate and to all intents and purposes – maintenance free. For those readers looking for a ‘General Service’ watch without equal then I feel that there is no better way of spending less than £100.00. 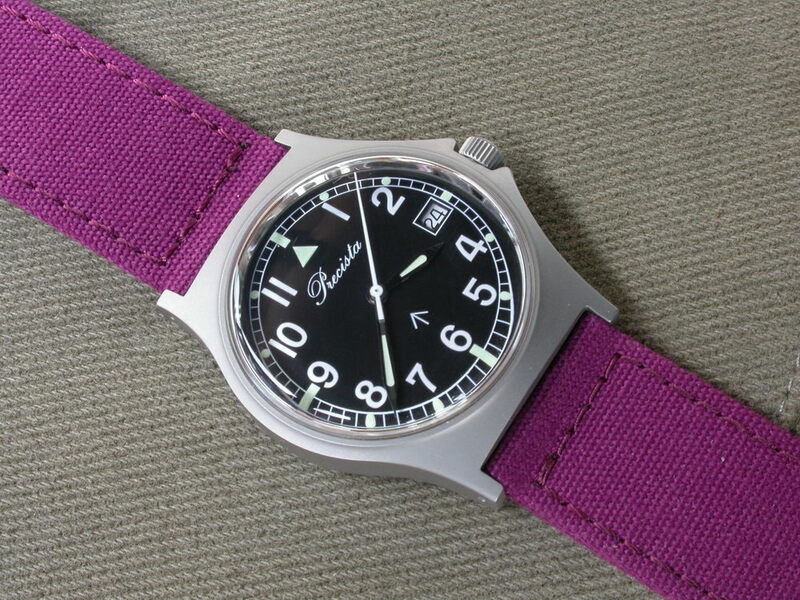 Tagged G10 Watch, Military watches, Precista, Precista PRS-10. Bookmark the permalink.